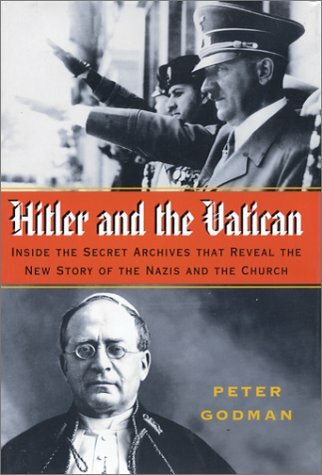 Documents the controversial relationship between the Catholic Church and the Nazis, citing how a communist-wary Vatican maintained a policy of non-interference in Nazi persecutions and withheld crucial information about Nazi activities. 50,000 first printing. The Church condemns as heretical the opinion that human nature is not essentially the same in all people, but that mankind which now inhabits the earth is composed of races so different from one another that the lowest of them is even further from the highest race than it is from the highest kind of animal that resembles man. Had this sentence been made public, it is certain that Hitler would have recognized the damned opinion because he had expressed it himself in his "victory speech" held before the congress of the National Socialist Party on November 3, 1933. The Führer would no doubt have reacted with rage to criticism by the Church, for racism was a cardinal doctrine in the Nazi creed. The Vatican's plans were far-reaching. Aimed at views stated in Mein Kampf and in Hitler's other writings or speeches, they struck at such fundamental elements in the ideology of National Socialism as "blood" and its "purity": "The Church condemns the view that any mixture of blood with a foreign and inferior race, in particular a mixture of the Arian with the Semitic race, is, by reason of that mixture alone, a most heinous crime against nature and marks a grave fault in the conscience." All people about whom there are grounds to fear that they may produce imperfect offspring may be prevented from contracting a marriage that could be fertile, even if they are otherwise capable of marriage, and they may be sterilized, even against their will. Children conceived by parents of this kind may be removed by the direct intervention of an abortion. As to the education of young people, they should not, in first place, be imbued with religious sentiments or with love and fear of God but with a feeling of affection for the race so that they regard nothing on this earth with more respect than the race and the state built on the basis of racial character. Nothing but the absolute and unlimited leadership of one man is the form of government in the state that is in keeping with the lawful path which nature follows in selecting races and individuals. Any other form of government is more or less a contravention of nature. Single individuals and associations of people have no rights, either by divine or natural law, which are prior to the state or independent of it and not only is the exercise of rights decided upon by the state but even their origin and simple existence. The program of National Socialism and its practice were being branded as incompatible with Christianity years before Pius XII mounted the throne of St. Peter in 1939. His predecessor Pius XI (1922-39) and other leading figures in the curial establishment believed that such statements would be interpreted, in Germany, as a declaration of spiritual war. The story of how and why the Catholic Church planned to condemn the Nazis, and of what became of those plans, sheds new light on the inner workings of the Vatican on the eve of the Second World War. The sources, previously inaccessible, enable us to penetrate behind the scenes and understand the ways in which, after the Nazis came to power, Rome thought and operated. The operations of the Roman authorities -- not always a model of efficiency -- were conducted through an ill-coordinated bureaucracy that followed procedures which had developed over centuries. Attentive to precedents set in the past, members of the Curia knew that history provided them with several possible forms of condemnation, at various levels of solemnity. The forms in which Rome's statements were made, and the contexts in which they appeared, could convey messages subtler and more precise than the public declarations of a secular state. There was a significant difference, for example, between a papal pronouncement of disapproval reported in the Vatican's semiofficial newspaper, Osservatore Romano, and an anathema leveled by the Pope as head of the Church's Supreme Tribunal. The first resembled a rumble of thunder, menacing but remote. The second was similar to a bolt of lightning, aimed to strike at an error, root and branch. A decree from the Supreme Tribunal, signed by the Pope, had binding force on Catholics in matters of doctrine and morals. In these matters of fundamental importance, the judgment of the Supreme Pontiff was definitive. When he condemned an error with the weight of his unerring authority, it was announced by that papal tribunal known, since the sixteenth century, as the Roman Inquisition or Holy Office. One of its severest sentences, delivered as punishment, was excommunication -- exclusion from the community of the faithful, to which Adolf Hitler nominally belonged. Less punitive in effect and more positive in purpose were the encyclicals, or papal letters, which expressed the magisterium ("teaching") of the Pope. Issued in his name, often on the basis of contributions made by members of the Vatican's bureaucracy, such documents represented declarations of principle by the head of the Roman Church. Beneath these two peaks of solemnity -- the encyclical and the inquisitorial decree -- lower levels of publicity could also signal the Vatican's view. Works might be placed on the Index of Prohibited Books, indicating that they were banned for Catholics; diplomatic notes of protest or clarification might be exchanged with foreign governments; instructions might be imparted to orthodox institutions of learning, ordering them to contest suspect ideas. During the 1930s, all of these possibilities were considered or implemented by Rome. When and why they were employed or discarded, and by whom, were questions that engaged Hitler's attention. The Führer was sensitive to the nuances of the Vatican's official voice. Ambiguous in his alternations between respect and loathing for the Church, he hesitated to repudiate Christianity. Its language, its categories, its images loom large in Mein Kampf and in his later writings and speeches. Divine providence, Hitler claimed, guided National Socialism in its struggle for "racial purity." Jesus Christ, for him, was not only "the true God" but also "our greatest Aryan leader." The next figure in the Führer's pantheon appears to have been himself. Like Mussolini, he saw himself as a redeemer. Unlike the Duce, Hitler claimed that his movement had discovered the true meaning of the New Testament. The Old Testament was excluded because it was "Semitic"; God's law was to be identified with racism. Hitler portrayed himself as the prophet of this doctrine, which the Catholic Church had perverted; and the "positive Christianity" to which the program of the Nazi Party referred was meant to heal the confessional divisions between German Catholics and Protestants, and to unite the nation in its fight against the Jews. The Jews and the "Bolsheviks" played leading parts in Hitler's melodrama of hatred, and he dressed them in demonic costumes. Yet the confusion of roles produced by his misuse of religious language never led the Führer to forget that, on the world stage that he desired to dominate, the Vatican still occupied some of the limelight.